Home > Meche-Art > Dogs & Cats > What A Great Day! Dog Portrait Oil on Canvass, "What A Great Day!, 24x20, by Mercedes Franklin. For Sale. The Photographer "Yalla's" dog portraits totally inspire me! This is a dog from her collection. We both have the same feeling of excitement when we are with them. I can only hope she is happy with the back ground I created for her wonderful photo! 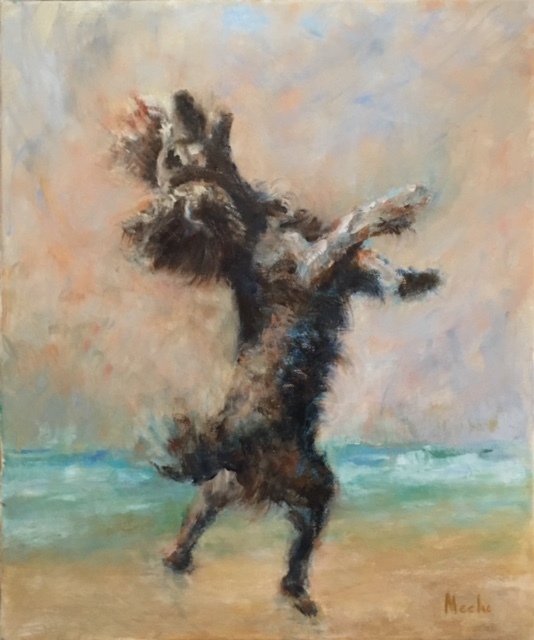 This is the #1 painting of my "Flying Dog" collection. I am up to 4 paintings, working on #s 5 & 6. This series is something new for me. I am painting energy, movement & thought towards the unknown. This shouldn't be too scary since we, the earth & all that inhabits along with the cosmos, are made up with same, though various, arrangement of elements. We should be very comfortable in the unknown knowing in time it might be known?? ?